8022, HUBCAP COPY CHROME 17", 05-06, CHRYSLER, 300M, 20 FINS, 5 LUG NUT HOLES, NO LOGO, HELD ON BY METAL CLIPS. 8022, HUBCAP USED, 17", 05-07, CHRYSLER, 300M, 20 FINS, SPARKLE SILVER PAINTED, 5 LUG NUT HOLES, RAISED LOGO, WORD CHRYSLER, HELD ON BY LUG NUTS. 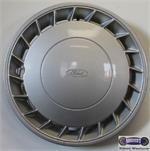 889, Hubcap used, 14", 91-93, FORD, MUSTANG, SPARKLE SILVER, 20 FIN TYPE. ENGRAVED WORD FORD IN CENTER, PLASTIC CLIPS & WIRE RING.